On Monday November 19, 2007 I decided to attempt a BBG to test out some new farkel’s I added to my Wing. This was a last minute decision as I was not sure until then that I would have the time to attempt the BBG. I have ridden a few rides that are harder and longer like a BBG 3000 already so I was pretty sure I was going to be successful as long as something beyond my control did not happen. I have ridden over twenty rides of 1300 miles or more in a 24 hour period in the last two years. 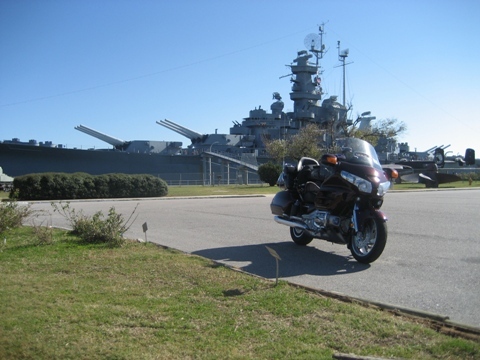 My route was from a gas station close to my house to the USS Alabama Battleship and back to the same gas station. The route was I-75 north to I-10 west and back the same way. It is 758 miles each way. I know these roads very well and was only worried about how much traffic was going to be on the roads the day after Thanksgiving. My reason for this BBG attempt was to test the new microphone integration kit from Kennedy I installed on my 2007 Wing. This allows me to use my Bluetooth phone with my Garmin Zumo 550 to receive and make calls while ridding. I also wanted to test a new service called Jott that allows me to call the service and leave a short message that is then transcribed and posted on my Blog or sent to a predefined email address. My plan was to leave around 4:00 am to get a head start on any Thanksgiving traffic that may develop. I got up at 3:00 am and got ready to leave. I had prepped the bike the days leading up to the ride so the bike was ready. I normally keep my wing ready to ride always just in case some opportunity comes up for a ride. I headed out to the gas station which is only a mile from my house to meet my witness, Bill Boklan, an IBA member. Bill was there waiting on me and signed my witness form and was also going to be my finish witness and would meet me back at the same location for the finish. My starting receipt had the time of 3:36 am. I was off and headed for I-75 and the Alligator Alley. I headed out across the Everglades and it was 67 degrees not bad. There was hardly any traffic this early in the morning and it being the day after Thanksgiving. About half way across the Alley fog started to set in. The fog lasted almost to the end of the Alley and where I-75 curves north. My ride was going well until it started to rain. Fortunately I had my gear already on so I did not have to stop. It rained almost all the way to Tampa. After Tampa the rain had stopped but the traffic started to pick up. I had a phone call from Jason Jonas saying he could not make it to the USS Alabama Battleship for lunch because of work. I was able to take this call while riding because of my Kennedy Zumo 550 Microphone integration kit. Made it to the USS Alabama Battleship at 1:57 pm. The first half of the ride was 758 miles. It was cold, around 44 degrees, and hardly no one was there. On the ride back I stopped at a Love’s truck stop because they had an Arby’s and man do I love Arby’s. I got some gas and then had two Arby’s sandwiches. Back on the road traffic was light on I-10 east bound. I was making good time and came upon the I-75 junction pretty quickly. Made the turn south on I-75 and headed for home. The ride down I-75 was uneventful and went smoothly. I came upon the curve where I-75 heads east across Alligator Alley and paid my toll with Sunpass so I did not have to stop. I arrived back at the starting location at 12:57 am. It was a total of 1517 miles according to the GPS. It was a nice ride that got the juices flowing. All of the new gear worked well.